King cake cocktail? Yes, please! Earlier, we shared cocktail recipes for TAAKA’s king cake-flavored vodka (more). – Before getting started, if you do not already keep one there, put cocktail (martini) glasses in the freezer for at least a half hour. – Pour a tiny amount of cinnamon liqueur onto a small plate, just to cover the bottom. Also, pour the sugars onto another small plate. Form a circle with each color making up one-third, or 120 degrees for the mathematically inclined. 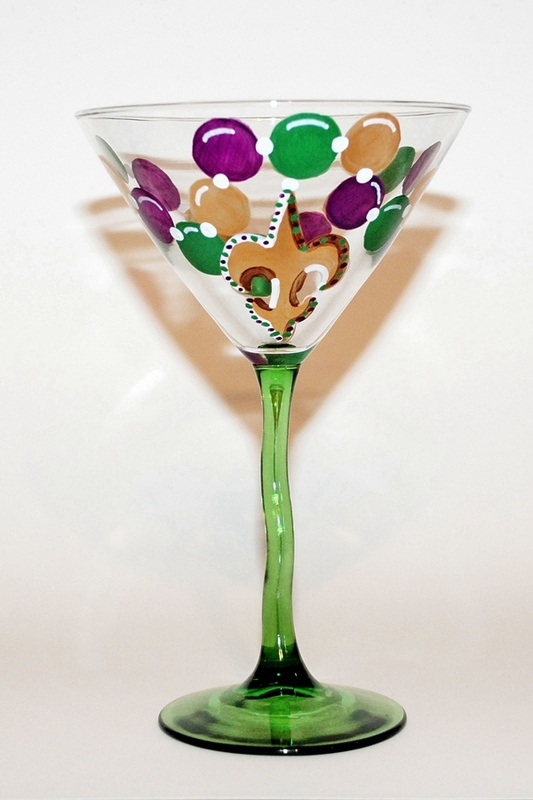 Your glass will be dipped in this to provide a beautiful Mardi Gras colored ring around your cocktail. -Fill a mixing glass one-third with ice, something like a draft beer pint glass works great. Add the ingredients and roll back and forth into another glass to combine. Rolling as opposed to shaking a creamy cocktail like this reduces excessive foaming. It is important to use a lower alcohol cinnamon schnapps, if you use one with a much higher proof than listed, the cream will begin to separate. – Dip the rim of your chilled glass first into the liqueur plate, than the sugar plate. Strain the liquid from the mixing glass into the beautifully rimmed, chilled cocktail glass leaving the ice behind. – Toss in king cake baby for fun and drink up. And just a reminder, don’t eat the baby. Yes, really. There is also Taaka king cake flavored vodka. If you want a side of hangover to go with that sugar. Have you tried it? I saw it at Rouses for $6 but I haven’t added it to my liquor cabinet yet. These are the are the recipes I posted earlier for king cake flavored vodka cocktails. The pineapple one sounds interesting. I have to drive to Shreveport from Fort Worth to buy it. Lucky Player is expensive but was worth it until I found Taaka for $7.19 a bottle. It seems to be a little sweeter and just as delicious! I got 5 bottles for the price of one Lucky!